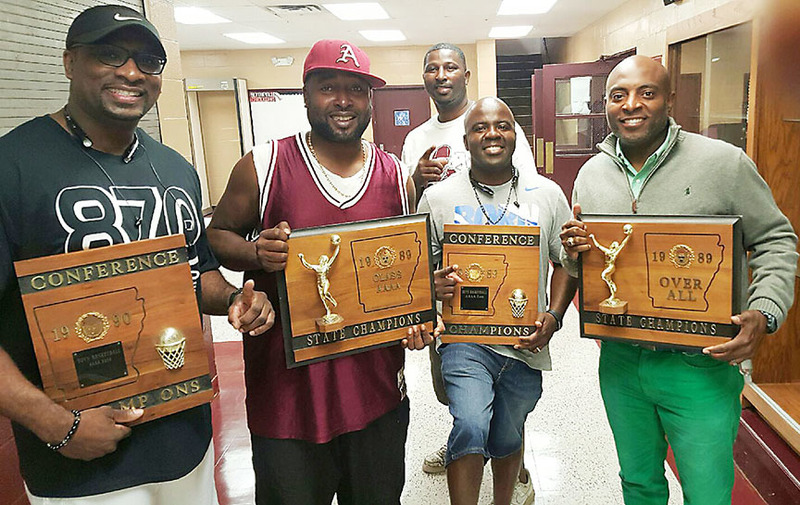 Marty Granderson (left) is holding the trophy the Blytheville Chickasaws won for finishing first in the AAAA-East in 1990 with a 10-0 record for the third consecutive season, and Fred Haynes, Rickey Jackson and Barry Jackson are all holding conference, state and Overall trophies earned by the 1989 Chickasaws. Behind them is Paul Fowler, who joined the Chickasaws in 1990. Don’t blame the 1989 Blytheville Chickasaws if they didn’t exactly set the world on fire with their “Phi Slamma Jamma” way of scoring points. They weren’t known for their fast breaks and triple-digit capabilities. What’s important is the Chickasaws had a way of thwarting teams that did have those backgrounds, and it carried them all the way to state and overall tournament titles that year. The Chickasaws won with defense - aggressive, in-your-face, stifling defense. They could score points when they had to, but in some games they scored just enough to win. The thing is, though, they won. They always won. Playing the Chickasaws from the mid-1980s through the early 1990s, even scoring against them at times, was like swimming through molten lead - painfully impossible. Their head coach, Danny Ebbs, built in Blytheville what at that time was the most revered program in all of Arkansas. He left Blytheville after the 1990 season to become the head coach at Henderson State University, and he remained there for two years before working for various public schools in Arkansas for another 20 years. Today he is the athletic director for all Pulaski County Schools, which includes Sylvan Hills, Maumelle and J.T. Robinson high schools as well as Mills University Studies. The Chickasaws were defending state champions in 1987 and defeated Marianna in the semifinals to set up a showdown with the Fayetteville Bulldogs - on Fayetteville’s own court. Blytheville wound up losing to the Bulldogs 57-49, but that established the beginning of a defensive tradition that would propel the Chickasaws to tremendous glory just two seasons later. The ’89 Chickasaws’ overall championship was the third for Ebbs, who also won in 1977 with the Stephens High School Lady Roadrunners and in 1979 with the Parkdale High School Dragons. The 1989 Chickasaws finished with a record of 30-3, including a flawless 10-0 record in the rugged AAAA-East. They also won the NEA Tournament by stifling Ridgecrest (soon to be Paragould) 58-45 in the title game. In the AAAA finals at McFadden Gym in Pine Bluff the Chickasaws edged fellow league rival West Memphis 49-48 in overtime. Ed Cullins, one of only three senior BHS team members, earned State Tournament Most Valuable Player honors despite scoring a mere five points against the Blue Devils. Blytheville’s triumph over West Memphis was its 13th in a row and 19th in its last 20 games. The Chickasaws worked past Fort Smith Northside 52-49, with the Grizzlies coming into the game as the No. 1 club in all of Arkansas. Blytheville beat El Dorado 57-49 in the quarterfinals, and in the first round the Chickasaws ran from North Little Rock Northeast 72-60. The AAAA champion Chickasaws defeated Class A champion Delta 78-73, and against a strong AAA champion Malvern club the Chickasaws proved why they were the best team in the state, winning 56-41. The defending champion Chickasaws again had a strong campaign in 1990, defeating Forrest City 58-53 to go to 10-0 in the league once again (they were also 10-0 in 1988). Blytheville did lose to West Memphis 52-46 in the NEA Tournament finals, but in the AAAA State Tournament at West Memphis the Chickasaws whipped NLR Northeast again 76-63 and Little Rock Parkview 77-65. In the semifinals against the Blue Devils the Chickasaws fell 55-54 when Barry Jackson fouled a Blue Devils player and that player hit one of two at the free throw line. The Chickasaws tried to score in the waning seconds, with West Memphis knocking the ball out of bounds with just three seconds to go. Blytheville’s inbounds pass went to Fred Haynes in three-point territory, and he was forced to try a long shot that failed, and West Memphis, though they would lose to Pine Bluff the next night, finally exorcised the demons that had inhabited their souls for two years. Later in the offseason Ebbs would resign to take the HSU job. Barry Lamar Jackson, a junior with the ’89 Chickasaws, is employed at Hyundai Motor Manufacturing in Montgomery, Ala., and has been a manager in the Team Relations department of Human Resources for the past 11 years. Jackson and his wife have three children - son Sedrick and twins Zaiden and Ziah. Willie Johnson, a junior forward and one of the leading scorers for the ’89 Chickasaws, on April 12 will have been a probation and parole officer with the State of Missouri for 18 years, working primarily in the Caruthersville and Steele areas. He received his Bachelor of Science degree in sociology and criminal justice in 1994. A four-year member of the basketball team, two of those years under Ebbs, Johnson was the 1991 Freshman of the Year for the Reddies in the NAIA District 17 Conference. His career 225 three-pointers is third in Reddies history, and his nine three-pointers in a single game is tied for the lead in the team’s history. Johnson is married and has two daughters and a grandchild. After high school Marty Grandson, an 11th-grader, ventured north and is now in the production department of the Grain Craft Milling Company in Cleveland, Ohio. In August he will have been at Grain Craft 19 years. Granderson has no children. Edward Lee Cullins, a senior and the most valuable player of the 1989 State Tournament, is 45 and still loves to play basketball. “‘The will to win is the will to prepare,’” he stated, referring to Danny Ebbs telling his players that if a person wants to win, he must first have the will to prepare. Cullins followed Ebbs to Henderson State, later earned his associate’s degree at Mississippi County Community College in Blytheville and then his Bachelor of Science degree in industrial technology from Arkansas State University in 2006. After 10 years he retired from Mid-South Health Systems, and now owns and operates Cullins Auto Sales in Blytheville. Single, Cullins has three adult children. Fred Jordan, 44, the starting point guard for the ’89 Chickasaws, is a certified surgical technician who works with the University of Texas-Southwestern Medical Center. He is part of a surgical team, preparing the equipment and supplies and then passing the equipment and supplies to surgeons during an operation. He attended Fortis Institute in Dallas for 16 months to gain certification, and he has been a technician for the last seven years. Before that, Jordan worked at Federal Express for five years and Prime Point Media, also out of Dallas, for a couple of years. He also spent a couple of years in the printing industry. He has a son, Jacob, and a daughter, Kealie, and stated that “I am very happy where I am. Everick Tracy, 45 and an 11th-grader in 1989, lives in Irving, Texas, where he has had his own courier company for three years. His company transports economic merchandise for both commercial and residential customers. He has also worked part-time at Federal Express for 21 years. Tracy’s weekend business of renting party supplies includes “bounce-houses”, chairs and tables. He also owns four houses. Tracy has one grown son and three grandchildren. Larry Smith, a senior with the ’89 Chickasaws, drives for the May Trucking Company of Salem, Oregon. He had his own semi truck for three years before selling it, and drove for U.S. Express of Chattanooga, Tenn., for three years. He spent three years as a Lowe’s supervisor in Little Rock. Now based in Little Rock, Smith has three daughters and a son. Rickey Jackson, also a junior, graduated from Arkansas State University with a degree in manufacturing engineering in 1997 and is self-employed, doing business as a realtor in Jonesboro for ERA Realty. He also owns Jackson’s Construction, working both residential and commercial construction. Jackson is married and has four children. Eleventh grade forward Fred Haynes is now an Arkansas state-licensed wastewater operator with the city of Blytheville, and a volunteer coach with youth teams in the Blytheville School District. He is married and has five children. Haynes signed with Central Baptist College of Conway out of high school and finished as a basketball player for Arkansas Baptist College of Little Rock. Junior shooting guard Charlie Sullivan earned a Bachelor of Science in Education in Social Studies degree from the University of Arkansas and returned to Blytheville as a history teacher and Chickasaws assistant coach. He departed to become an assistant manager for Lowe’s in Longview, Texas, but returned to Blytheville at the start of the 2016-17 school year as a teacher at the Blytheville High School ALE program. He is married and has three children - daughter Emily and twins Will and Wyatt. At the invitation of his father and stepmother, Odell Knowles, a junior at BHS, moved to Huntsville, Ala., in 2001. He now works for Patrick Industries in nearby Decatur, operating a “feeder” machine. He has seven children. Jim Patterson, 44, a sophomore with the ’89 Chickasaws, graduated from the U.S. Naval Academy in 1995 and served aboard the USS Kitty Hawk for three years as a supply officer, dealing with numerous supply chains. He spent two years in Sydney, Australia, as part of an officer exchange program but still in a logistics role. Patterson worked for Caterpillar, Inc., in 2006 in manufacturing, parts and distribution, and moved to Lancaster, Pa., five years ago to become a plant manager for the High Concrete Group out of Denver, Pa. He was married five years ago and has one daughter. Roy Alexander Wells, Jr., was a local business owner in Blytheville. He was born Dec. 8, 1971 and died June 22, 1998. A junior with the ’89 Chickasaws, he was 26 years old. Kelvin Harris, a junior member of the ’89 Chickasaws, graduated from BHS and became a mechanic in Blytheville. He was born July 25, 1972 and died Nov. 7, 2004. Harris was 32 years old. Reginald Lamont Thomas was the third senior member of the 1989 Chickasaws, but was not available to respond with current information. Corey Anderson, senior manager of the Chickasaws, dealt with illness for a significant part of his life, dying of a heart attack on Aug. 8, 2007. He was born July 14, 1970 and was 37 years old. Hixson became head coach in 1990-91 after Ebbs left, and he directed the 2006 Chickasaws to a 29-1 record and championship in the AAAA State Tournament in Little Rock. At the end of the 2011-12 campaign Hixson stepped down and is now Blytheville’s athletic director. EDITOR’S NOTE: Much appreciation is expressed to Barry Jackson, Charlie Sullivan and Fred Haynes, all members of the 1989 Chickasaws, for their assistance with this story, and to former assistant coach David Hixson for providing a copy of the state and overall 1989 Chickasaws team photo.